As ministers from OPEC and its allies arrive in Vienna for crucial talks, all have made clear they agree on the need for a cut in oil production. But none have explained how they’ll turn that desire into a reality. With just a day to go before a critical OPEC summit, Saudi Arabia and Russia are set to meet Wednesday for make-or-break preparatory talks that’ll set the direction for the oil market. 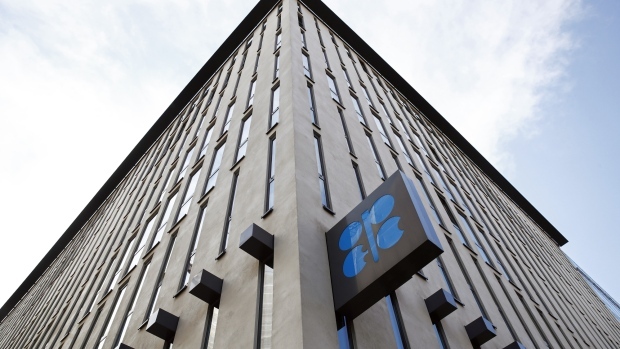 The stakes are high after prices suffered their largest monthly drop since the global financial crisis in November, and politicians including Donald Trump call on OPEC to keep energy prices in check. In an interview Tuesday, Saudi Energy Minister Khalid Al-Falih cautioned that a deal wasn’t yet done, saying it’s “premature” to suggest the OPEC+ group -- which includes allies Russia and Kazakhstan -- will agree to curtail output. That’s less bullish than statements he made a month ago in Abu Dhabi calling for 1 million barrels a day of cuts. Crude gave up much of its gains on Tuesday following his comments, and fell as much as 2.1 per cent on Wednesday. The last time the OPEC+ group agreed to curb output, in late 2016, it settled on a combined 1.8 million-barrel-a-day reduction. In preparatory meetings ahead of this week’s summit, delegates have said a cut of as much as 1.3 million barrels a day next year is needed as demand growth slows and U.S. shale production surges. The opportunity for countries to put their cards on the table comes Wednesday at the Joint Ministerial Monitoring Committee, the panel that oversees the 2016 deal. Both Al-Falih and his Russian counterpart, Alexander Novak, will attend that meeting, a day ahead of the full OPEC gathering on Dec 6. In private conversations, OPEC delegates have said that Russia and Saudi Arabia still differ on how to share the cuts. Saudi Arabia has argued that Russian proposals implying a cut by Moscow of as much as 150,000 barrels day would leave the kingdom shouldering too much of the burden, and insisted there should be a more equal partnership, implying a figure closer to 300,000 barrels a day, people familiar with the talks said. Another issue is the baseline for the reduction. Some nations want to have it at October output levels while others prefer sticking to the original deal, which used 2016 levels as the base.